Thanks to everyone who entered - was a lot of fun!! Congrats Raiana, we'll be in touch!! I NEVER win anything. Thank you so so much Jen and to Jill Sorenson - I am beyond excited and can't wait to get restyling our bedroom!! I appreciate this beyond words...so excited. I say congrats to Raiana as well. I love it when someone who never wins anything gets it! I hope you will post pics so that all of us can drool! Yes Raina, please post pics - and Congratulations! Congrats Rai! 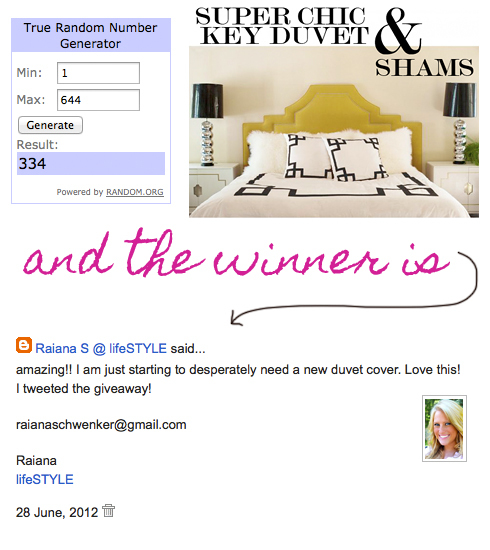 Imagine my surprise to see one of my favourite people winning something so beautiful from one of my favourite blogs! Congrats! And yes please post pictures! Congrats Rai! Imagine my Surprise to see one of my favourite people winning winning something so beautiful from one of my favourite blogs! Yay! Congrats Raiana - you are a blessed lady!! Happy 4th to all of you from Australia.. :):) We had a celebration for you all for some of our American friends living here in Melbourne! !